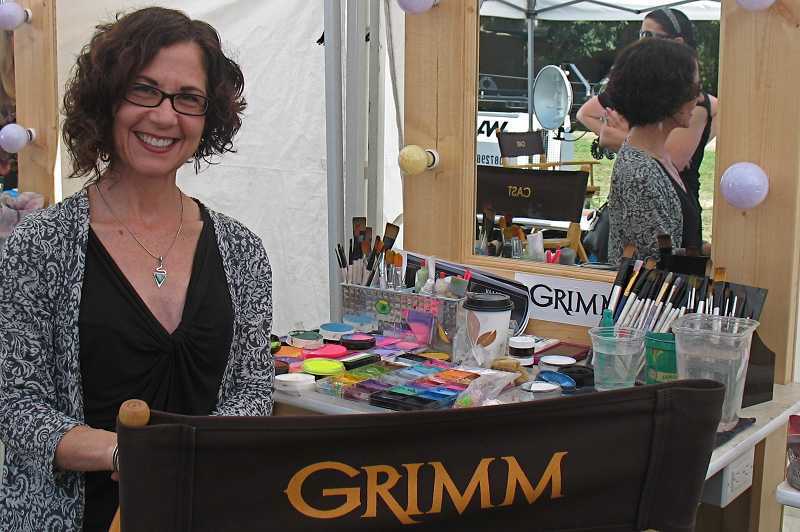 – West Linn artist Kim Millen was hired to paint trick or treaters for the Halloween episode of ‘Grimm,’ which will air Oct. 26 at 9 p.m. on KGW channel 8. West Linn artist Kim Millen has a unique effect on people. Her colorful paintings brighten homes and offices throughout the Northwest. Students of all ages in her art classes appreciate her encouraging manner and skillful techniques. But those who become her canvases are perhaps the most excited about her work. Millen is a body painter and has painted literally thousands of masterpieces on faces, arms, legs and whole torsos from New York to Arizona as well as locally. She began body painting years ago when Lake Oswego Festival of the Arts organizers hired her to paint faces during Children’s Day. She and her daughter got a real kick out of transforming children into tigers, butterflies and other creatures through face painting. And the children were thrilled to wear their art. Since those fledgling days her business, UB Painted, has boomed. And her body painting truly can transform a person’s look and personality. Each fall for the past dozen years, Millen has spent a couple of months in New York, where she gets inspiration. “I limit myself to $10 a day,” she said. “I’m really on a budget.” To help her studio rental and other expenses Millen teaches art classes and also takes appointments for body painting on Halloween weekend. Bands, nightclubs and hosts of private parties have enlisted her talents to take their Halloween celebrations to the next level. “The Grimm staff is so friendly,” she said. “I painted the children’s faces before they went on to the set. It was fun for the cast and crew to see them in full makeup.” Millen couldn’t say more about the experience but encouraged readers to watch the episode Oct. 26 at 9 p.m. on KGW channel 8. Millen’s body painting talents have been included as entertainment at church auctions, corporate team building events, children’s birthday parties and at West Linn’s farmers’ market. You can have Millen transform you for free today from noon to 8 p.m. at the ribbon cutting and open house event for Adroit Family Dental, 5493 Amy Street in West Linn. Adults and children are welcome to have a free face painting, take a tour of the offices and meet Dr. Kirill Smirnoff and the staff of Adroit Family Dental. For more information call 503-710-9839. To learn more about Millen visit kimmillenart.com or ubpainted.com. U B PAINTED IS THE TOP RATED FACE AND BODY PAINTING BUSINESS IN PORTLAND. READ REVIEWS BELOW OR VISIT YELP AND GOOGLE! “Hit of the PARTY!!! Princess’s and Pirates 3rd Birthday bash: My husband and I met Kim at the Happy Valley 4th of July party in the park, our then almost 3 yr old Natalie have a snowflake painted on her cheek. She LOVED the experience and we wanted to surprise her for her 3rd Bday party so I called Kim. It was an awesome experience from the first call, the the photo’s she sent after the party. We ALL had a blast kids and adults a like. The face painting and surprise visit from Elsa (Whom Kim arranged) was the HIT of the party. The kids loved her, she was dressed as a princess too, and even the boys loved getting dragons and pirate headbands painted on. 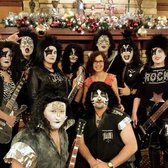 We can’t wait to have our holiday party and have Kim come and paint for all of us “big kids.” Kim came to my home to paint several people for a New Year’s Eve party. She was knowledgeable, efficient and was able to conceptualize everyone’s ideas, as well as ad her own. She had great energy, skill and was beyond what our group was looking for. We took many photos and had a photographer (who she recommended). 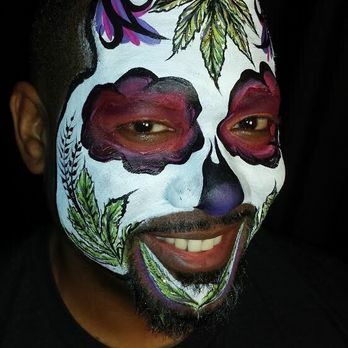 Hire U B Painted to create your unique “costume” (face to full body) for that special event or we can paint at your venue! We are available for custom work, private parties, clubs, and photo shoots. Being painted is relaxing and SO FUN. Do you want to show your appreciation to your hard working employees by hosting a fabulous party or picnic? U B Painted works with you to create a gathering that will be fun and memorable! Face painting is always the favorite activity for kids at company events! Teens and adults also want to be painted after they see our graffiti tattoo and glamorous eye designs! Just watching our artists create is entertainment! We can also paint your logos or if time permits, any image from a phone! For larger crowds we can create quicker designs, bring additional painters and even costumed line managers! Fun is had by all! THE EASIEST WAY TO THROW A BIRTHDAY BASH THAT WILL BE LONG REMEMBERED IS TO HIRE AN INCREDIBLE PAINTER TO ENTERTAIN YOUR GUESTS! Treat your birthday child, WHATEVER AGE, and your guests to a fun and interactive painting experience! Each guest can choose from many face, leg or arm designs, each becoming different as they choose their own colors and style, even special requests! A special design is provided for the guest of honor birthday guest of honor! Parties = my favorite event! PORTLAND’S TOP QUALITY PROFESSIONAL FAST FACE PAINTING! -Passionate about creating a fun and memorable experience! Two hour minimum. Rates from $85 to $125 an hour per artist. We feature a two hour small party package at *$185! Travel charges may apply. Please read “Services and Prices” on homepage to view PRICE information on your special event! Please fill this form out for a quote! Thank you! Date and times artists are needed. What is the age range of the guests? Tell me about your event! Company party? Who's Birthday? How old? Themes? How many face/body painters would you like? How many waterproof glitter/mica tattoo artists would you like? How many balloon artists would you like?